This is a wonderful holiday read. Eve Canaday can't believe Ben Tyler is leaving Marietta right before the holidays. She's been crushing on him forever and now he's leaving. Well that had been the plan until there is a little mishap with her car and a reindeer. Now Ben is stuck in Marietta for the holidays and he's been roped into helping a young girl great some magical Christmas memories along with Eve. So much for getting out of here without letting his heart fall for Eve!! Definitely a recommended read. 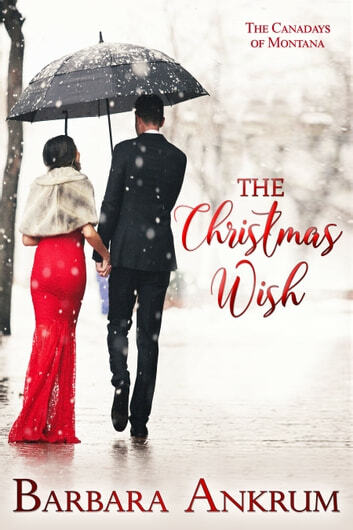 The Cowgirl’s Christmas Wish by Barbara Ankrum is her third Canady book. This is Eve and Ben Tyler’s story. Eve is the party planner who for the past year has been friends with Ben. Ben grew up in Marietta, followed his dad’s footsteps to become a doctor, and is now an orthopedic surgeon at the hospital. Ben does not have good memories of Christmas as his parents jet set around the world, without him as he grew up. Ben is restless, not understanding how to fill the emptiness within. He decides to leave Marietta and join a medical group working in Haiti. Or at least spend his Christmas joining the group to see if it is what he wants. However fate intervenes on his way to the airport. As Eve is driving him she runs off the road and into a tree to avoid hitting an elf. Only it’s not an elk. It’s a reindeer. Upon returning to Marietta Hospital, Ben and Eve find their friend Malcolm there after falling off a ladder while hanging Christmas lights. It seems that before his wife died last year she left messages around town for Malcolm and daughter Lily reminding them the importance of celebrating Christmas. With Malcolm laid up in the hospital Ben and Eve take over caring for Lily and celebrating Christmas. As Ben and Eve spend time together Ben recognizes how important Eve is in life and realizes her love for him. These letters left for Malcolm not only remind him of the importance of celebrating Christmas but also the value of living and loving. Reading these letters also remind Ben of those significant facts. Ben needs to decide whether or not to take a chance on Eve and love or go to Haiti as he had planned. This was a sweet, fun and entertaining story with very likeable and authentic characters that you want to cheer on, hoping for that happy ending. The characters were well written with complex characteristics. The story line was riveting and kept my attention to the very end. The story line was riveting and kept my attention to the very end. I genuinely enjoyed reading this book and had trouble putting this book down, reading it in one day. I highly recommend this book to other readers. I voluntarily reviewed a complimentary copy of this book. LOVED this book, read in one day. The magic of Christmas has hit Eve and Ben with the help of a little girl, Lily and letters from Lily's deceased mother. The letters were meant for Lily's dad but he he is recovering in the hospital, so he has asked his friends Eve and Ben to help with Lily during the holiday season. Eve and Ben have been friends forever, Eve wants more but Ben is leaving Marietta forever to work in the jungle as a doctor. Can a few letters, a little girl and the magic of Christmas change his plans? Loved the reindeer!! I highly recommend this book this holiday season!! Great romantic read. Colorful characters adding to the most unpredictable and exciting story. Readers will be thoroughly enthralled with every page. Unsuspecting episodes of romance and intrigue.